The FAQs contain a wealth of information on a variety of topics and common questions regarding rice. The FAQs cover optimum cooking times, tips on reheating rice as well as key differences between varieties of rice and important dietary information. Love Rice has become aware of a number of videos and news items being circulated on social media sites which claim that ‘plastic rice’ is entering the food chain. Please be assured that there is no evidence of any rice entering the UK being contaminated with plastic. UK rice millers are committed to providing safe, high quality food; and undertake systematic controls and a rigorous set of testing when importing and milling rice. This includes, but is not limited to, testing at the point of: origin; purchase; import; delivery; during manufacturing; and before it goes out to consumers. There is no evidence of any rice entering the UK being contaminated with plastic. Some social media videos show ‘plastic rice’ being compressed into a hard, bouncy ball. When heated, the natural components of rice - carbohydrates (starch) and proteins (specific amino acids) can react in this way. It does not suggest the presence of plastics or other foreign material. How much rice is in a portion? A portion of 60g uncooked rice is an average sized portion. It equates to about one generous handful. Glutinous rice is so-called because of its exceptionally sticky ('glueyâ€™) quality which is caused by the unusually high levels of amylopectin. The name can cause confusion as it is seemingly associated with 'glutenâ€™; like all rice, glutinous rice does not contain gluten and can be consumed as part of a gluten-free diet. Glutinous rice predominantly comes from Southeast Asia and is commonly used in both sweet and savoury dishes. Rice milk is a naturally sweet milk derived from processing rice grains. It is popular among lactose intolerant people or consumers with allergies. What is jasmine rice? And other variants? Jasmine rice is a variety of long grain rice, best known for its distinct aroma caused by the compound 2-Acetyl-1-pyrroline. It most commonly associated with Thailand (Thai fragrant rice or Thai Hom Mali), but is also cultivated in Cambodia on the Thai-Cambodian border. The rice as harvested from the fields, and before it is milled, is known as paddy rice. The first stage of the milling is to remove the outer husk (or hull) of the rice producing brown rice. Brown rice can be further milled to move the bran (remainder of the husk and germ) to produce the white rice most commonly consumed in Europe. How many different types of rice are there? Grown across over 150,000,000 ha worldwide, more than 40,000 varieties of cultivated rice (the species Oryza sativa) are believed to exist. But the exact figure is uncertain. Over 117,000 samples of cultivated rice and wild species are stored at the International Rice Gene Bank, which aims to conserve rice genetic resources and improve rice varieties. While called rice, â€˜wild riceâ€™ is actually a grass generally found growing in shallow water, and is most commonly cultivated in North America, although some wild rice is grown in Hungary. It is a good source of vitamins and minerals and high in dietary fibre. No GM rice is commercially cultivated worldwide, and therefore cannot be found on the European market. Research field trials on GM rice have been undertaken in some parts of the world e.g. China, the US and the Philippines. In the Philippines, The International Rice Research Institute has been working for many years on the development of a variety of rice popularly known as Golden Rice. This rice, whose name derives from the orangey appearance of the grains, has been developed to contain high levels of beta-carotene and with the aim of addressing vitamin A deficiency in many Asian populations. The commercialisation of this rice is not expected before 2018/19. I have heard there might be arsenic in my rice? Rice is an important and nutritious contributor to a balanced and healthy diet. As arsenic is naturally present in air, soil and water, a wide range of foods - including rice - may contain arsenic at low levels. Milk and dairy products, along with drinking water are also significant sources of arsenic. When traces are found in rice it is mainly in the less harmful organic form. The quantities of inorganic arsenic in rice are generally very low, and tend to be found in regions such as Bangladesh where there are higher levels of arsenic in the soil and water. Average levels of inorganic arsenic are well below the new maximum limits established by the European Commission in January 2016. Testing by European rice millers has found that more than 99% of samples comply with the new legislation. These results demonstrate that there is no health risk associated with the regular consumption of rice purchased in the UK. Could there be cadmium or lead in rice? Heavy metals such as cadmium and lead are present in soil and known to be absorbed into growing crops such as rice. The potential presence of such contaminants is strictly regulated under European law and carefully monitored by national health authorities. Assessment by the European Food Safety Authority in 2010 found extremely low levels of lead in rice, with no sample exceeding established limits. The possible presence of lead in rice came to the media's attention in 2013 following a press release issued by the American Chemical Society reporting findings of 'harmful levels' of lead in rice. This report surprised the toxicologists in the field, as there was no other published evidence of rice containing the levels of lead of the same order of magnitude as that reported in the press release. The veracity of the results, unrepeatable by the scientists, pointed to an error in testing and the paper was ultimately withdrawn. The potential presence of cadmium in rice came to public attention in 2013 due to reports of high levels of cadmium found in rice in the southern Chinese city of Guangzhou attributed to the growing number of factories and mines in Hunan Province, where the rice is grown. In Europe, which does not source rice in significant quantities from China, a legal limit of 0.2mg/kg has been established (less than half the levels reported in China). The presence of heavy metals in rice is well-known and closely controlled by the rice sector. Findings of levels in excess of the EU limit on the European market are extremely rare and any products above this limit must be removed from the market. The last reported finding of excessive cadmium in rice product in Europe dates back to 2009. Where can I buy specific types of rice? What is basmati and how is it different to other types of rice? Basmati is a type of fragrant rice uniquely grown in specific regions of India and Pakistan characterised by its typical aroma, and the elongation of its grains when cooked. The name basmati comes from vasmati, the Sanskrit for fragrant. Indian basmati is predominantly grown in Haryana, but other cultivating states include Himachal Pradesh, Punjab, Rajasthan and Uttar Pradesh. In Pakistan, the majority of the basmati is grown in Punjab. In both India and Pakistan, there are several varieties of basmati rice for example: basmati 370, basmati 385, PK 385, and Super Kernel Basmati Rice. Researchers constantly develop new varieties of basmati, which respond well to local environmental conditions and give better crops for local farmers. New varieties require approval by Indian or Pakistani authorities before being marketed with the basmati name. There are no GM varieties of basmati rice. As worldwide demand for basmati rice is high and of the area of cultivation limited to the region around the Himalayas, the price of basmati rice to the consumer is generally higher than other long grain varieties. To ensure that consumers are receiving quality basmati, the UK, Europe's largest basmati market, introduced a code of practice which sets out purity standards. The standards can be enforced using DNA testing. Basmati importers and exporters elsewhere in Europe also make use of the UK Code of Practice and other countries e.g. France are currently looking to introduce comparable standards. What sort of rice does my Chinese / Thai / Indian restaurant favour? Chinese Regular white Long Grain rice is the preference for Chinese food. â€˜Regularâ€™ means the long grain rice has not been parboiled. The result is white Long Grain rice that is naturally sticky. Did you know that the origin of the Long Grain rice served in Europe is never actually from China? Although China is the worldâ€™s #1 rice producer it has no exportable surplus. The Long Grain rice we consume in Europe may well have been grown in Italy, Spain, or even as far away as Thailand or the Americas. Indian A good Indian restaurant in Europe will typically choose basmati rice. Premium Basmati rice should have long slender grains with a unique aroma. Thai Fragrant Jasmine rice is the authentic rice for Thai food. Basmati and Thai Jasmine are the two aromatic rice varieties in the world. Thai Jasmine rice is always milled and consumed within a few months of being harvested. Sometimes you will see large bags of Thai Fragrant Rice labelled â€˜New Cropâ€™ because the younger the grains the better. With Basmati rice it is the exact opposite: Basmati is typically matured for a minimum of 6 months before it is milled, this is to ensure the grains are firm. Thailand has up to three harvests a year and is the worldâ€™s largest rice exporter. After rice is taken from the fields, its outer husk (or hull) is removed producing brown rice. Brown rice retains the bran, which gives brown rice its colour. Rice can be further milled to move the bran (remainder of the husk and germ) to produce the white rice most commonly consumed in Europe. For people with diabetes, ensuring the right balance of foods is particularly important. This includes a careful choice of the amount and type of carbohydrates which directly affect blood glucose levels and need to be balanced with activity levels and insulin dose. For example, a larger serving (150 g cooked weight) of boiled rice provides 210-250 calories and a small serving (100g cooked weight) provides approximately 140- 60 calories. By contrast a typical takeaway portion of fried rice is 300g providing around 560 calories, so itâ€™s important to pay attention to both the quantity and type of rice consumed. As a general rule (International Diabetes Foundation Guidebook 2014), consumers with diabetes are recommended to choose wholegrain (brown) rice which on average has a lower GI. There are two main types of starch present in rice â€“ amylose and amylopectin. Rice varieties with a high amylopectin content, such as Thai glutinous rice are associated with a higher GI whereas basmati rice, particularly wholegrain Basmati rice, tends to have a lower GI score because it contains more amylose which is digested more slowly. What nutrients does rice contain? The precise quantity and quality of the nutritional content of rice varies according to the variety of grain and whether it has been milled or parboiled. Brown rice usually contains higher levels of vitamins and minerals and is a source of fibre. Parboiling, which is necessary to make easy-cook rice, cause the transfer of some water-soluble micronutrients from the husk to the endosperm. The table below provides an indication of the nutritional value of different types of rice. Yes, Rice is one of the few cereals that is free from gluten and rarely causes unpleasant reactions or digestive difficulties. Is rice ok for children / infants to eat? Rice is suitable for children who are weaned and happily eating solids. Can I eat rice everyday? Rice can be eaten daily with other nutritious foods to create a balanced diet. How long should I cook rice for? What is the difference between parboiled / easy cook rice and other rice? Parboiling is a method of processing rice, which involves wetting, boiling (with the application of steam) and drying rice. Parboiling improves the nutritional value of rice, by concentrating vitamins and minerals into the endosperm and reduces its stickiness making it easier for consumers to cook. How long can I keep rice in the fridge for? Cooked rice should be left to cool at room temperature, but not left to stand more than two hours. If refrigerated within this time period, preferably in an airtight container, the rice may be kept for four days. When removing from the refrigerator, look at and smell the rice. Any rice which smells off or has changed appearance should be discarded. Cooked rice that has been refrigerated can be reheated either on a stove or in the microwave. One tablespoon of water should be added for every 100g of rice. Why is there little fair trade rice? Fair trade rice can be found on the European market, but its presence on the market is less significant than other crops such as coffee or bananas. Price fluctuation, one of the principal arguments for ensuring farmers adequate protection through minimum prices, is as common for rice as for other crops. However, total world trade of rice represents only 8% of world production, thereby diminishing somewhat the impact of world prices on domestic prices and farmer revenues. In addition, domestic support programmes â€“ such as that introduced in 2011 in the world's largest exporter Thailand â€“ providing minimum prices for farmers are not uncommon, potentially undermining the attractiveness of fair trade schemes. Is rice grown in Europe? Where? 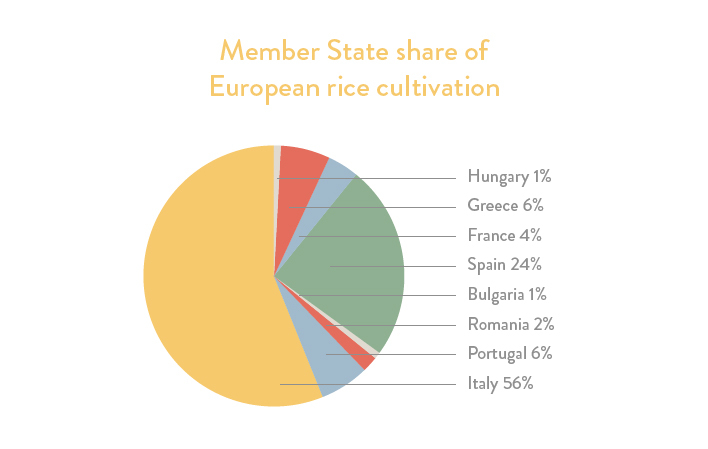 Rice is commonly associated with Asia, but approximately 2/3 of rice consumed in Europe today is grown in southern Europe, predominantly around the Mediterranean Sea. The remaining one third of rice eaten by European consumers is imported from a range of countries, including: Cambodia, Guyana, India, Pakistan, Thailand, Uruguay, US and Vietnam. Why do rice prices vary so much? Only 8% of the rice produced worldwide is traded on international markets, making tradable surplus relatively scarce. This makes rice prices particularly susceptible to events which affect either production (such as drought, flooding, storms) or rice available on the international market (due to domestic policies restricting the trade of rice for food security reasons). For example, in 2008, the world saw a rapid rise in rice prices following India's decision not to allow the export of rice. As a staple crop, such price rises can have dramatic effects on countries that are dependent upon rice imports. In 2008, countries such as Senegal and Haiti faced civil unrest due to rising rice prices. Is rice good for the environment? The impact of rice production on the environment is complex, having both positive and negative implications. The negative environmental impacts of rice production, namely methane emissions, are well documented and have been the subject of significant international research and initiatives. As rice is a vital staple crop, the challenge is to improve the sustainability of global production. Recent research has pointed to the potential to reduce methane emissions by over 40% through mid-season drainage and intermittent irrigation strategies. Rice production also makes an important positive contribution to the environment through the sequestration of carbon dioxide from the atmosphere, the maintenance of vulnerable ecosystems, and the regulation of water management. In European rice-growing regions, for example, rice production constitutes an integral element in the delicate balancing of water resources. Paddy fields act as deep sub-surface aquifers (important storage points that are critical to long-term sustainable water use), providing a natural defence against flooding during periods of high precipitation and prevent the encroachment of sea water and salinization. In addition, wildlife experts such as the RSPB have stressed the essential role of European rice production in ensuring the survival of wetland wildlife. How is rice grown? How long does rice take to grow? How many crops per year? How is it harvested? In Europe, the climate in rice growing regions is typically characterised by rainfall in April to June, followed by a dry summer. Rice is planted from mid-April to the end of May and is harvested between mid-September and the end of October. The rice is generally cultivated in poorly drained soil which enhances the efficiency of water use. Rice seeds are generally mechanically sown; however, in Italy, seed drilling in dry soil also occurs.